Founded 23 years ago, the South Bay Cities Council of Governments (SBCCOG) is a Joint Powers Authority of 16 cities and unincorporated areas of the County of Los Angeles. 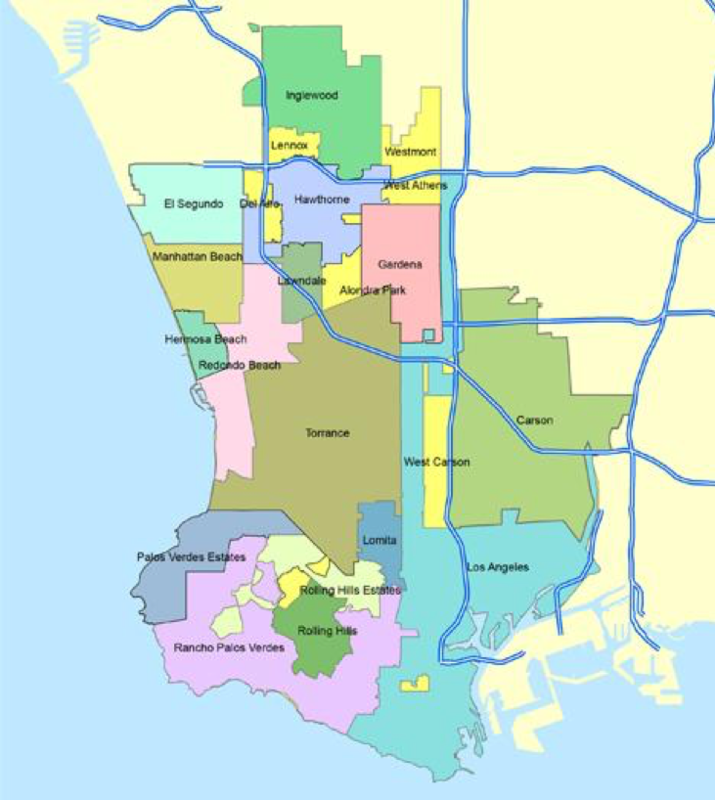 Uniquely, the SBCCOG’s service area is a diverse geographic and demographic territory that includes the beach cities south of Los Angeles Airport to the Port of Los Angeles, the affluent Palos Verdes Peninsula and larger inland cities like Carson and Inglewood –whose air quality ranks them high as disadvantaged air-quality districts. The SBCCOG’s core mission is to work with its member cities to improve environmental quality and increase awareness among their residents and local businesses while maintaining economic prosperity through effective sub-regional coordination. One of the flagship programs of the SBCCOG is the South Bay Environmental Services Center (SBESC) which serves as a clearinghouse for information on environmental and sustainable programs. Working with utility partners as well as the Sanitation Districts of Los Angeles, local water agencies and the Los Angeles Metropolitan Transportation Authority, the SBESC outreach efforts include projects to assist local businesses and educate residents on energy efficiency, water conservation, recycling, and travel options – sustainability strategies that positively impact their bottom-line while enhancing the quality of life in the south bay. The SBCCOG is also proud to announce two important and innovative accomplishments that have just been completed. 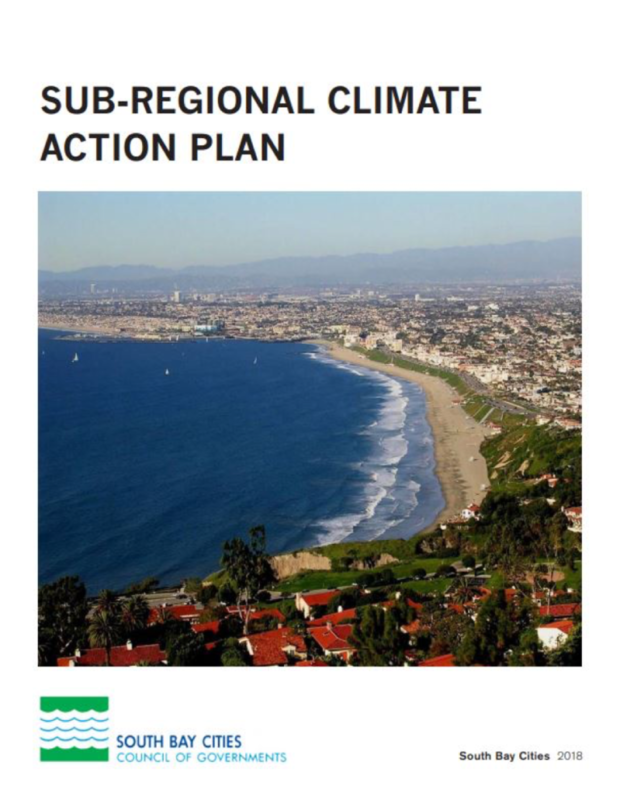 The first is the adoption of Climate Action Plans (CAPs) for all 15 South Bay cities and the second, is the development of new methodology for a sub-regional climate action plan. Since 2008, the SBCCOG has worked with its member cities on climate action planning in the South Bay. When embarking on this project, the SBCCOG recognized that while many of its member cities wanted to initiate climate action planning, they did not have the resources, budget, or staff to devote to such activities. The SBCCOG’s solution to this issue was a sub-regional approach to the management and coordination of inventorying municipal and community-wide emissions and climate action planning. This leveraged process allowed the SBCCOG to work with its member cities in a collaborative fashion to maximize resources, save city and data providers time, and maintain a consistent approach to the method, process, and resulting climate action plans. The SBCCOG’s work-process allowed all South Bay cities, whether large or small, to establish greenhouse gas (GHG) inventories that now serve as a baseline to measure the success of selected strategies for reducing GHG emissions. Working city by city, the SBCCOG presented and assisted in the selection of each city’s respective strategies for reducing GHG emissions. All 15 cities have since adopted their CAPs or are using the document as the foundation for implementation. The CAPs, which include chapters for Land Use & Transportation, Energy Efficiency, Solid Waste, Urban Greening, and Energy Generation & Storage, serve as a policy tool for planning, economic development, and sustainability. By working collectively, the SBCCOG has positioned each city as well as the sub-region for future funding and partnerships as well as adaptation and resiliency opportunities. Beyond the work-process to complete and adopt 15 climate action plans, the SBCCOG updated and expanded the methodology for climate action planning – introducing new GHG reduction methodologies that promoted a “leave no neighborhood behind” approach and adding items such as electric vehicles. The neighborhood strategy drew almost 15 years of land use and transportation research that was conducted in the South Bay. The findings resulted in region-specific alternative land use and transportation strategies that focused on enhancing mobility within neighborhoods without relying on underdeveloped transit or the building of (future) expensive transit infrastructure – both of which are key to the traditional paradigm for GHG emission reduction strategies but are not available in a built-out suburban region like the South Bay. This innovative strategy for neighborhood-oriented development (NOD) which includes the development of neighborhood centers is supported by slow-speed zero emission vehicles to decrease vehicle miles traveled (VMT). It has been adopted by the SBCCOG Board of Directors as a concept to guide future growth for the South Bay sub-region. When and if implemented, NODs will exceed the State’s 2035 GHG emissions reduction goals. Importantly, this methodology can serve as a tool for similar regions throughout the State. Adoption of the South Bay cities’ CAPs has only recently been completed and already many cities have found use for their city’s CAP as a planning and guidance document on issues like active transportation and bike sharing or for updating their city’s General Plans. Moving forward, the SBCCOG intends to build upon the collaborative success of its Sub-regional Climate Action Planning efforts to identify additional funding to assist our cities in implementing their strategies through adaptation and resiliency grants and programs. The SBCCOG is proud of the work it has done in leading the way for climate action planning for the vibrant South Bay sub-region. Through this process, its member cities have been provided with meaningful tools to enhance the quality of life for residents and secure a sustainable future. South Bay Cities Council of Governments member agencies include Carson, County of Los Angeles, El Segundo, Gardena, Hawthorne, Hermosa Beach, Inglewood, Lawndale, Lomita. Los Angeles, Manhattan Beach, Palos Verdes Estates, Rancho Palos Verdes, Redondo Beach, Rolling Hills, Rolling Hills Estates, and Torrance.